Ratonhnhaké:ton. There, now I can just copy and paste it for the rest of this review, instead of having to remember how to spell it. In case you didn't realize, Ratonhnhaké:ton (pronounced kind of like "rawtone-haKAAYton"; the colon just means that the vowel before it is held longer than the others, and can be left out when writing it) is the same guy as Connor - since his name was too hard to say, his mentor, Achilles Davenport, suggested the name "Connor" as an easier alternative for interacting with the colonists. Because even back then, white people insisted on everybody adapting to their culture. 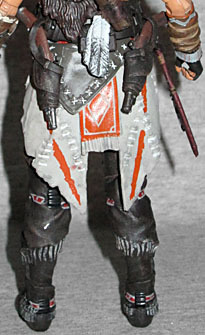 Rather than coming directly from Assassin's Creed 3, this figure comes from the "Tyranny of King George" DLC, an alternate reality look at the characters, where Connor never became an Assassin and George Washington was corrupted by the Templars - so think of this as Elseworlds or Age of Apocalypse Connor, if that helps. Even without being inducted into the Brotherhood, Ratonhnhaké:ton still ended up wearing a white hood to go about his business. Of course, this time it's a wolf pelt worn like a hat, rather than a bleached piece of cloth, but the parallels are there. Hey, if Altair's genes were strong enough that he could pass down a facial scar to Ezio, anything is possible! The wolf skin hangs down over Ratonhnhaké:ton's shoulders, reaching all the way to his waist in the front. There's a pad of bear fur on his left shoulder (or something - it's dark brown, and it's not like there were bison in the colonies). There are feathers on the side of his head and on his chest, and a series of bone decorations pushed through the pelt. He's wearing the same buckskin boots as Connor, but he's topped them with a pale gray loincloth and a red sash. 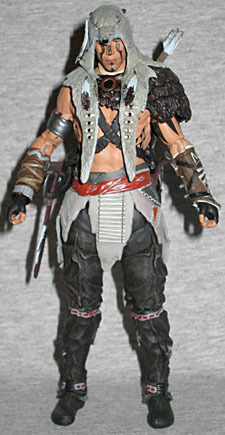 He's bare-chested, has a wide metal cuff around his right bicep, and hide wrappings around both forearms (though the left arm's is concealed by the hidden blade). I got Ratonhnhaké:ton for Christmas, so there was no comparing paint. However, everything looks fine. The dark brown war paint on his face, arms and sides is all crisp, and the apps seen on his feathers and bones all appear to be where they should. The stitching on his clothes, particularly once you get around to the back, are a bit haphazard, but no more than usual. The fringe on his boots is painted, and there are bands of color around the ankles and knees. This is a good-looking toy. 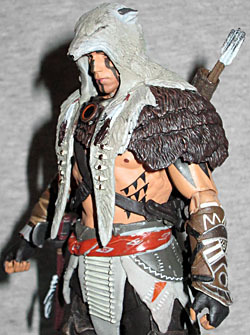 Having played with five of McFarlane Toys' Assassin's Creed toys now, the articulation style is growing on me. No, it's not as well designed as NECA's articulation was, but the range of motion is there, for the most part. I mean, if we can accept big visible Revoltech joints, what's wrong with these? After all, this is a McFarlane toy; moving at all is more than we expect from them. 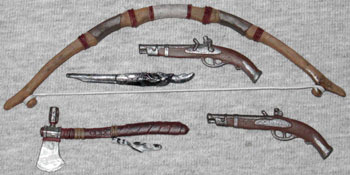 Ratonhnhaké:ton comes with many of the same weapons as Connor: the bow, pistols, and hidden knife. In fact, the only one that's different is his tomahawk - because, again, no joining the Assassins, no getting the Assassins' swag. The name "Altaïr" means "the flying (one)," and "Ezio" means "eagle." Heck, even "Haytham" (Connor's father) means "young eagle"! Ratonhnhaké:ton breaks that trend. "Ra-" is a masculine prefix; "ohn" means "spirit" or "life"; "aké:t" means "scratch" or "emerge"; thus, his name could mean "he scratches to survive," suggesting his tough life, or "his spirit comes out," refering to the way he learned about his heritage - Mohawk names are not literal, and are meant to be open for interpretation. Since it's not a real historical name (in Iroquois culture [of which Mohawks are a part], only one person can use a name at a time), there's no tradition or context to tell us what it was understood to mean. In honor of the culture, Ubisoft even agreed not to trademark the name. Just like I got the Golden Age of Piracy set simply because it was three cool pirates, I got Ratonhnhaké:ton because he was a cool indian; and cool he is, even if you haven't played the games. No question NECA could have done better, but McFarlane did okay.